Match your specific production requirements to the right Rapid-Air Feed model, then integrate it into a complete, superior coil handling system. Improve production with faster material flow speeds and uniform accurate progressions. Rapid-Air pioneered the first compact air feed with internal air circuitry, setting the technological and performance standards for the industry. The unique dual air valve system provides outstanding performance backed by reliability that has made Rapid-Air the recognized innovator and leader in air feed technology. Rapid-Air feeds offer unmatched production flexibility. Their cost-effective operation often justifies permanent installation on die sets to minimize job setup time. Easy installation and removal make Rapid-Air units the most versatile type of feeding equipment available. Two bolts are all it takes to install one. Stroke length and speed adjustments are positioned for easy access. Feed a variety of material in any direction. All kinds of coil stock plus paper, plastic, wire, fabrics, foil, tubing, extruded and performed shapes can be fed at short and long progressions, and at different production speeds. 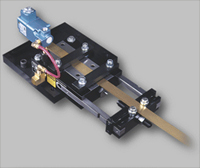 Rapid-Air feeds are unequaled in handling both thin and delicate materials. Several actuation options allow our feeds to be used on standard production presses, electric presses, hydraulic presses, wire forming machines, multi-slide machines and special machines.